Kick up your chocolate, hard candy or baking recipes with this hot and spicy all natural ingredient. Designed to be used as an accent flavor along with other flavors - it’s truly a gourmet sensation! Try it along with LorAnn’s Mango, Lime, Cherry, or wherever you want a spicy kick of flavor. 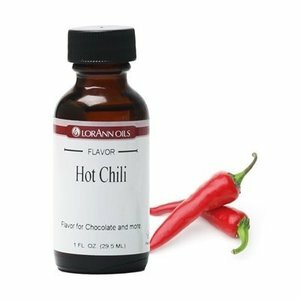 Appropriate for use in chocolates and coatings (typical use is ¼ to ½ teaspoon per pound) Kosher certified • Gluten-free Caution: Hot Chili Oil is highly concentrated and can cause irritation and a burning sensation similar to the oil of a fresh hot chili pepper. Avoid contact with skin, eyes or mucous membranes. For contact with skin, wash area immediately with warm soapy water to remove oils. For contact with eyes or mucous membranes, flush with cool water. Seek medical attention if burning sensation persists. As with all our super strength flavors, we recommend the following safe handling tips: keep out of reach of children, wipe-up spills immediately, do not use with plastic utensils, avoid direct contact with countertops and avoid rising steam when making hard candy.